Chicken Teriyaki (鳥照り焼き) is grilled chicken lacquered with a sweet soy teriyaki sauce. If you haven't had teriyaki before, you'll be delighted with the flavour. Ideal for every occasion because it's so quick to make, the stir-fry combines plenty of healthful vegetables to make a very colourful dish. 4. For the vegetable stir fry, heat oil in a pan and saute all the vegetables and add vinegar, sesame oil and sesame seeds. 5. 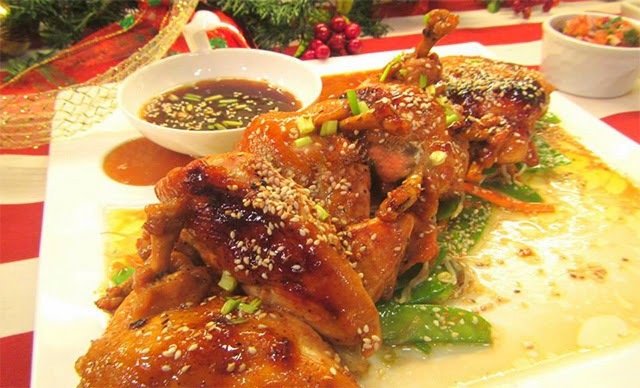 When chicken is cooked, place chicken on top of the vegetables and serve with some teriyaki sauce on the side.